Detail from One Nation, Under Law, adorning the lobby of the Tallahassee Courthouse annex. This collection of murals by artist Lincoln Perry portrays crucial moments in our judicial system's evolution. Renovations to the historic Winston E. Arnow Federal Building were completed in 2011. 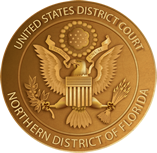 The Member List, Rules of Procedure, Notice Related to Applications, and the Application for U.S. District Judge are now available.